SYNOPSIS: This spin-off follows a new original storyline and introduces the unwritten chapter of DEATH NOTE and reveals how the legendary detective “L” (Kenichi Matsuyama) spends the final 23 days of his life. The story begins as L takes on the “Kira” case, in which countless criminals are dying under mysterious circumstances. L successfully solves the case and stops Kira, but only after sacrificing his life, leaving himself with only 23 days left to live. For his final case L faces down a bio-terrorist group trying to wipe out humanity with a deadly virus ten times more potent than Ebola. As L tries to formulate an antidote with a scientist, he must also save the lives of two children who have no one else to turn to. DEATH NOTE: L, change the WorLd features what happened before and after the two earlier DEATH NOTE events and shows DEATH NOTE fans the more human side of L that could not be seen previously. The movie stars Kenichi Matsuyama (Linda Linda Linda, NANA and Detroit Metal City) as ‘L’, and for dubbed version, L’s voice is played by Alessandro Juliani from the anime series. REVIEW: Be a witness of world’s best detective’s last 23 days, and watch how his brilliant mind and flawless intuition solves and saves the world once again from another wicked opponent. Not really. 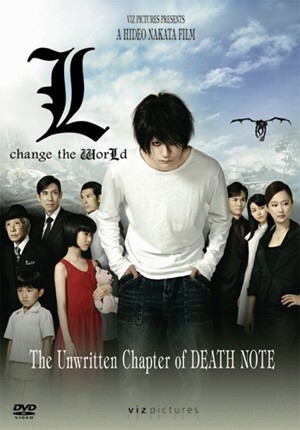 L Change the World, an original story on Tsugumi Ohba’s famous character: L could have been an exceptional way to close the Death Note series, but it ended up being nothing but a simple spin off. The movie is entertaining, I will give it that, the plot and the story line are acceptable enough to spend the whole 129 minutes watching it, however it does not feel like any of the Death Note movies, anime, or manga. The movie has an interesting story, is not as fantastical and appealing as the first two movies, but it does have many qualities to make it fit to the original one, like the characters, the stakes, and I also like how the director linked the first two movies into this one. However, it lacks something the other two had, and what makes a movies great : a formidable foe. In this movie although the threat is as evenly match as in the first two movies L is not faced with an opponent as smart and appealing as Light Yagami was. I thought the movie was suppose as the first two a battle of wits between L and K, plus a race against time, since L’s destiny is already written, but unfortunately the challenge does not even measure to this. It was very disappointing that this movie did not delivered any surprising moment at all, it was very straight forward, and it is even more disappointing that there was little reference to the Death Note movies. Yes it touches some moments from the original movies at the beginning, but as it progresses all the mysticism simply goes away. I was waiting for a shocking junction between one crisis to another, I was even looking forward to see Ryuk having a supporting role. Everything is not bad in this movie, I really enjoy Kinishi Matsuyama’s performance as the calculating, almost insensitive, candy lover L. he actually depicts the manga character as its best. He looks, talk, and move like L. I also like how the writers gave him more human feelings to his character. The movie also presents scattered situations that work one way or another, some are funny, other tries to link the story to the original story, and other are just good, like L’s escape vehicle, the plane scene, the side story between L and the boy, and the story between L, K, and Watari. Also I liked that they kept the original voices as in anime. As a Death Note Fan I recommend this DVD to all Death Note Fans who want to see how the story ends. However do not expect to see nothing out of the ordinary, for any other viewer I recommend to see the first two in order to understand it better. L would not change the world with this production, the film has the same effect as X-Men Origin: Wolverine and Terminator: Salvation had on their franchises: nothing. It is a shame that the unwritten chapter of Death Note should have also being unfilmed. SPECIAL FEATURES: In this department the video also lacks content, as other Death note DVDs it only has a short making of with interviews of the director, and voice actors(Japanese cast and crew), the promo and the preview form the other Death note movies it has a special insert with an L report( key observations about the character) and a cross word.